In his new book, an Episcopal bishop offers an alternative approach to pastoral leadership, rooted in a deep knowledge of self and the Benedictine values of stability, obedience and conversion. Pastoral leadership is not about having all the answers and always being right. It’s about knowing deeply and authentically who you are, with all your flaws and brokenness, says the Rt. Rev. Scott Benhase. “And that comes out of self-knowledge and self-reflection about your own things ‘done and left undone,’ your own fragility,” said Benhase, the bishop of the Episcopal Diocese of Georgia. 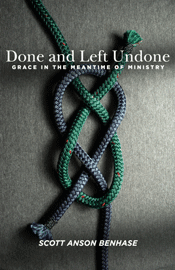 In his new book, “Done and Left Undone: Grace in the Meantime of Ministry,” Benhase draws on the writings of St. Benedict to propose an alternative approach to leadership. “It’s not ‘Do these things and you’ll be fine’ but instead ‘Take on the authentic self that you have and be willing to share that with other people.’ Create a context in which the leader is one who stands in the midst of the people, constantly proclaiming the great narrative of redemption in Jesus Christ,” he said. Benhase called pastoral ministry “the hardest job in the world” but said it can be done well without losing one’s soul and mind. “But to do that, you have to be clear about who you are, and where you stand, and who you’re standing next to, and who you’re kneeling before, and what your word is to yourself and to the world around you,” he said. Benhase was elected bishop of Georgia in September 2009. Before that, he served for 25 years in pastoral ministry, most recently at churches in Washington, D.C., Durham, North Carolina, and Charlottesville, Virginia. He spoke recently with Faith & Leadership about his new book. The following is an edited transcript. Q: To start, explain the title, “Done and Left Undone: Grace in the Meantime of Ministry,” which of course comes from the confession of sin in the Book of Common Prayer. It’s tied in to my own kind of Benedictine theology and approach. Leaders in the church often don’t come from a place of humility and authenticity about themselves. Clergy feel like they always need to be right and have all the answers so when a problem comes up, they can say, “This is what we need to do.” They’ll be strong visionary leaders with a “take the bull by the horns” approach. I tried that for a while when I was young, and I crashed and burned big-time. But as I got back into my Benedictine roots, I wondered how Benedict talked about the role of leaders in the monastery. We see that all the time now. Everybody has a prescription for how to turn around a church in a post-Christian culture. But most of those [success stories] are anecdotal and contextual; they’re usually around a particular personality and are few and far between. The frustration that I hear from clergy, and that I experience, is not so much about technique -- “Do these three things and be successful” -- it’s more about who you are in the context of your leadership. And that comes out of self-knowledge and self-reflection about your own things “done and left undone,” your own fragility. Q: So you’re saying it’s critical for clergy to be able to acknowledge their own flaws and humanity? People in the pews are actually attracted to that, and they connect with it. It’s not that you stand in the pulpit and talk about all your great sins. But if leaders can be honest about themselves and their own struggles with following Jesus, then they give people a space to join in that. If it’s about some sort of Pelagian achievement, that “I’m this perfect disciple of Jesus, so I’m asking you to do that, too,” people may follow you and underline biblical passages that you quote, but they’re not going to be invited to go deeper into their own souls and into self-reflection and own their brokenness and who they honestly are. If you can’t have compassion for your own foibles and sin and brokenness, then you’re not going to be very compassionate to other people. The book is not a blueprint. It’s the opposite of that. It’s not “Do these things and you’ll be fine” but instead “Take on the authentic self that you have and be willing to share that with other people.” Create a context in which the leader is one who stands in the midst of the people, constantly proclaiming the great narrative of redemption in Jesus Christ. Q: That’s a major theme in the book, the church leader as steward of the great narrative of redemption. What do you mean? Many churches are looking for a social activities director or a community organizer or a CEO. At times, the pastor needs to embody all those roles, but if any of them become your primary identity, then you’re sacrificing the one word that we have for this world -- that God has made things well in Jesus Christ. The primary task of the parish church leader is to be a steward of that great narrative, tell that story of grace and redemption again and again and invite people into it. When we get sidetracked being CEOs or community organizers or social activity directors or glorified administrators, we lose the very thing that we have that no one else has -- the story we tell. If we tell that story authentically and from our own sense of humility and the mercy that God has showed us, then the leader really does have something to share. At the core of the Christian proclamation is that God, in Jesus, reconciled the world back to God. If we’re not telling that story, if we’re not the primary stewards of that narrative, then what are we selling? Membership in some liturgical civic club? Q: So the primacy of the redemption narrative, in turn, shapes pastoral leadership? But all that does is heap the law on people, and they get that at their jobs -- or at home, if they don’t have a very loving spouse. We live in a performance culture, and we’ve turned the church into another place where people have to perform rather than a place where they go to receive the good news that God loves them no matter what. That’s the only thing we’ve got. But we try to make it a secondary or tertiary thing around some techniques that we’re taught to get the church back from its post-Christian context. That train has left the station. We’re not going back to the 1950s. Q: In your book, you propose what you call an ascetical theology of leadership drawn from St. Benedict. “Ascetical” simply means the practice of certain things. In ancient Greece, askesis was the practices, the training, that a Greek athlete would do to prepare for the Olympics. So what are the practices that pastors can do that will lead to a healthy, vibrant life for themselves and their congregations? It’s not so much “Do these five things and everything’s going to be fine.” But begin to take on patterns and practices in your life that are rooted, for example, in the daily office, saying your prayers, confessing your own sin, having some self-reflection time where you can recognize how much you’ve screwed up and how many times yesterday you weren’t kind to your spouse or whatever. It’s about taking on practices that help you be aware of yourself so that you’re grounded in grace and not in works and in judgment on folk. For a good part of my life as a parish priest, I spent entire sermons criticizing members of the congregation indirectly for their lack of stewardship, their lack of evangelism or whatever. It made me feel good and self-righteous, but it didn’t help change those folk. Q: Speak some to the specific Benedictine principles that you mention in the book -- stability, obedience, conversion. How do those fit into all of this? Benedict was a genius. He understood that if the individual in community doesn’t have stability in his or her life, prayer life and community life, then it’s easy to get distracted. It’s easy to run away, to find the grass to be greener someplace else. It’s like folks who church-shop. They are constantly looking for the perfect church. Well, that doesn’t exist, because the church is made up of imperfect, broken, sinful human beings. The perfect church isn’t out there. So Benedict was saying, yes, you can run to a different monastery if you want to, but you can’t run away from yourself. You need to be grounded in something -- live in the rhythms of common life with other folk, say your prayers, do your work together, and not run away from yourself and from your problems but face them in a context of a community that’s going to love you and care for you. It’s the only way I can find any kind of capacity to be real and to be authentic and real with my relationship with God. Obedience was not “Yes, sir, following orders” for Benedict. It was more about listening deeply to God in the longings of my own heart and the longings of people around me, listening to them, and listening to Scripture and ancient church teachings, and reflecting honestly on that. And by being obedient to that listening process, we place ourselves in the capacity to really hear God speak to us. Conversion of life happens only when we have been willing to be stable, stay with something and not run away, and stay there long enough to listen, reflect and be self-aware about all those things. And that places us where we can receive grace and have that constant conversion in our lives. It’s not technique. It’s about living in that mixture of stability, obedience and conversion where I’m constantly being renewed and refocused in my Christian life. Q: The book’s subtitle is “Grace in the Meantime of Ministry.” What’s that about? It has a double meaning. “Meantime” means the time between the first and second comings -- this in-between time, this time of constant anxiety and uncertainty that we live in, in the world. As Paul says, we see in a glass darkly. Someday we’ll see clearly, face to face, but right now, everything is out of focus. God forbid that we think the world is the way God intended it to be. Come on. Really? Does anybody look at the world and say, “Yes, this is how God designed it; this is the way God wants it”? No, this is not the way God intended the world to be. We are in the meantime. But it is also a mean time. This is true with identity politics and identity Christianity and social media. Social media promised to connect us to the world, but we have learned that the world is not a very good place to be connected to. I write a weekly column for our diocese, and I get replies that say, “Shame on you for saying something bad about our president. You’re an idiot!” I’ve had a couple of personal threats. We’re quick to tell people how wrong they are, but are we quick to reflect about stupid things we’ve done? Q: And as you point out in the book, pastoral ministry can be a mean time for many clergy. I had one person who just looked at me and said, “Well, you’re not very helpful” and stormed out, and then wrote letters to the senior warden about how awful I was. So yes, people are angry and disappointed with themselves, and clergy become a very convenient, inexpensive way to place blame. And you share with them the great narrative of redemption. That doesn’t work. It’s the snake oil that the church has been selling for way too long, and it’s not helpful. It doesn’t change lives, and it doesn’t present the gospel, as least as I read the gospel in the New Testament. And it can drive clergy to the brink of crashing and burning. I wanted the book to be a word of grace to clergy. You’ve got the hardest job in the world. There is no harder job in the world to do and to do well, but you can do it well, and without losing your soul and your mind. You really can, but to do that, you have to be clear about who you are, and where you stand, and who you’re standing next to, and who you’re kneeling before, and what your word is to yourself and to the world around you. If you can be clear about that, then you can survive all the other meanness that’s going on. You really can.